CINCINNATI - Napheesa Collier didn’t get to enjoy grabbing her 1,000th career rebound Thursday night as the UConn women’s basketball team lost at Louisville. The senior forward was going to make sure that the day she got her 2,000th career point had a happier ending. 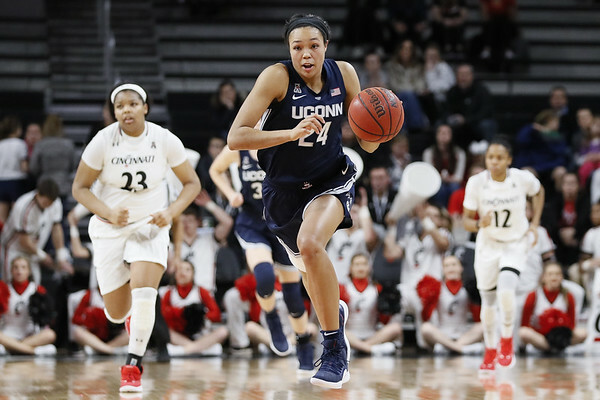 Collier had 20 points Saturday to become the 11th UConn player to reach the 2,000 plateau, and delivered a key steal and three-point play with 2:35 left, as the second-ranked Huskies held off Cincinnati 65-55 in American Athletic Conference action before a crowd of 2,996 at Fifth Third Arena. She also added 11 rebounds to record her 35th double-double and move past former teammate Gabby Williams into seventh on UConn’s all-time rebound list. The St. Charles, Missouri, resident is the fifth Huskies’ player to reach 2,000/1,000 and is alongside four members of the sport’s royalty: Tina Charles, Rebecca Lobo, Maya Moore, and Breanna Stewart. On March 2, she’ll join the four and the other UConn players to be named a WBCA All-American in the Huskies of Honor program on Senior Day at Gampel Pavilion. “Tina, Maya, Rebecca, and Stewie, that’s pretty good, huh?” UConn coach Geno Auriemma said. “Probably a bunch of Hall of Famers, right? A bunch of Hall of Famers, a bunch of Olympians ... I’m not the least surprised. I’m really, really happy for her. Collier played in her 133rd straight game and made her 95th consecutive start Saturday. She tacked on three assists, three steals, and a blocked shot in her 40 minutes. Along with her 2,003 points and 1,017 rebounds she has 315 assists, 204 steals, and 217 blocked shots. Only Moore and Stewart from the 2,000/1,000 club can match or better those numbers. Also, Collier and Katie Lou Samuelson became the first pair of classmates to reach the 2,000-point plateau. Samuelson hit the milestone on Jan. 13 against South Florida and added 12 points Saturday to put her total at 2,097. Stewart and Moriah Jefferson are the only classmates to score more than Collier and Samuelson, 4,208-4,100. Posted in Newington Town Crier, UConn on Sunday, 3 February 2019 21:27. Updated: Sunday, 3 February 2019 21:30.